Posted on Fri, Mar 2, 2012 : 10:40 a.m. I couldn't even tell you how long my family has been eating at the Evergreen Restaurant — likely since it opened in 1992. When my father was well enough to come visit in Ann Arbor, he inevitably took Jeremy and me to lunch there. So, because it's a long-time favorite, this seemed like a great place to feature today for Frugal Floozie Friday. There are a remarkable number of dishes you can order that are well within our mandatory $5 per person budget. 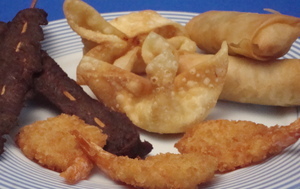 Above, you see the Evergreen Sampler for $8.99; it offers Spicy Beef Skewers, Tempura Shrimp, Spring Rolls, and Crab Rangoon. The fried items are all crisp and flaky, and the shrimp are tender and sweet within their coating. This appetizer was split among four people before eating dinner, and everyone enjoyed the treats. After the first course, orders of Sweet and Sour Chicken, Mu Shu Pork and Mongolian Beef were shared. If a dish is designated as "spicy and hot," you can request varying degrees of heat which are always respected and prepared perfectly. Other favorites among loved ones include Almond Chicken, perfect with its crispy coating; General Tsou's Chicken, which I've tasted from mild to significantly intense; and Beef with Spicy Orange Flavor, which features dried orange peels that contribute both flavor and fabulous aroma. Entrees are very generous at the Evergreen, and very few of them cost more than $10 per order; these can easily be shared among two or three family members and friends to stay within our strict fiscal guidelines. There is a tremendous variety of offerings, as well — I counted more than 110 options on just one side of the take-out menu before I got tired of adding them all up! The restaurant features Mandarin, Sichuan, Hunan, Shanghai and Taiwan styles of cooking, which might make one wonder whether there is too little focus. But in 20 years of eating there, I have never encountered a bad meal or known anyone who didn't happily devour his or her food. The staff is always very friendly and attentive. So stop by sometime and enjoy a great meal in a bright, welcoming atmosphere! Sat, Mar 3, 2012 : 3:05 a.m. Sat, Mar 3, 2012 : 4:09 a.m.
Fri, Mar 2, 2012 : 10:50 p.m. I was a loyal customer for about 5 years, and then the service went downhill when we started using the coupons for a 15% discount that are printed in various circulars around town, and we started to share dinners. We simply didn't want to eat piles of food or take it home, so we decided to each get appetizers and then share a dinner. Suddenly, the service changed, and not for the better. The last time we were there, the rice bowl was only half filled and was cold, and the portion on the dinner entree was half what it was in the past, for the same entree. We stopped going there, unfortunately, since it happened on more than one occasion and with the same waitresses as served us previously when we each ordered dinners and received good service. Just because people want to share dishes should not be a reason to give poor service. This is a good way to lose loyal customers. Fri, Mar 2, 2012 : 11:09 p.m.
Wow that's terrible. I always got good service there, although I haven't tried sharing food. They better be real nice to customers with Pfizer gone, the library in the mall gone, etc. Fri, Mar 2, 2012 : 11:05 p.m.
Fri, Mar 2, 2012 : 10:48 p.m.
Evergreen is the best Chinese food in town, but nothing can replace Forbidden City. Fri, Mar 2, 2012 : 6:52 p.m.
Fri, Mar 2, 2012 : 9:53 p.m.
Great Lake should make the list of really good. Emerald city was always good, but it just changed over to something else. Fri, Mar 2, 2012 : 7:12 p.m. I'm sure you could split the entrees at any Chinese restaurant and serve several people - it's great to eat that way, so that everyone can try a bit of each item! Fri, Mar 2, 2012 : 4:43 p.m.
Fri, Mar 2, 2012 : 4:57 p.m.
Love the food at Evergreen. Used to eat there alot more when I worked at Parke-Davis. Hopefully, they are getting enough business to stay afloat with the departure of Pfizer. Fri, Mar 2, 2012 : 3:40 p.m.